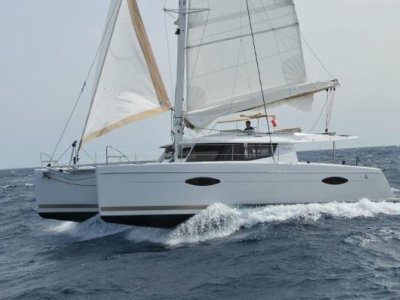 She's No Lady is the perfect example of a turn key cruising catamaran. There is truly nothing like it on the West Coast! The perfect size for a cruising couple or small family. She is completely outfitted with everything needed for living aboard or sailing off to Mexico and beyond. Due to an EPA engine recall, she just received 2 BRAND NEW Volvo 30 HP engines with "ZERO" hours on them. She's like a brand new boat! With the catamaran market on fire right now, "She's No Lady" is not going to last. Call for a personal tour today!